With the changes taking place in US late night talk hosts, there have been some enquiries about what shows Australia viewers will be able to see. A TEN spokesperson confirmed to TV Tonight that it would be taking The Late Late Show hosted by James Corden, but not The Late Show with Stephen Colbert. Colbert replaces Letterman who retires in May. Corden, who replaces Craig Ferguson, begins in March. It’s not yet clear if The Late Show with Stephen Colbert will be available elsewhere. @Craig : *Plays Twilight Zone music* Spooky! Those that are surprised by this should know Colbert regularly poked fun at Gina and Rupert. That is why Bolt is remaining and Colbert is not. Letterman’s show comes as part of Ten’s output deal with CBS, so they can take it. So Eleven are sticking with not showing the rest of the Late Late Show with guest hosts. But have decided to pick up Corden’s show in March. 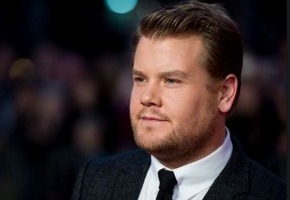 Corden is a UK comedy actor who does some stand-up and has bit of hosting experience. What was Craig Ferguson when he took on the job? Corden has got to be better than Letterman’s stilted delivery or Fallon’s poor ad libbing and interviewing skills. And he will cost a fraction of what Ferguson was getting, at least to start with. If and where Colbert ends up will probably depend on what CBS are asking. It’s always about money and the concern about straight-to-PVR. Shows like these have a short use-by date. Can Stephen cope with the transition from satire to Book/CD/Movie plugging? The Colbert Report was always lively but late night shows tend to have a soporific effect on the host, even if they’re recorded during the day. I hope that the show does get picked up locally but not by Foxtel. Financially probably makes sense – suspect the rights to this are cheaper than the main Late Show. I’m a fan of Letterman, but his time is up. However, I am a little surprised to see his show with Colbert not continue on Ten. But instead airing the Late Late Show with the lesser known Corden. So we lose CraigyFerg, Letterman, the character of Stephen Colbert, can’t get up to date and consistent Graham Norton. But we gain James Corden. @Mac – also do you remember the name of James character on Doctor Who… it was Craig Owens. Loved him on DW, such good stories both times. So a good news, bad news story, good to see we’ll get a change to see (and judge) James Corden in the job for our selves. Shame TEN have decided to not continue The Late Show after Letterman leaves, I’m just hoping given the time before he goes they will change their mind on Stephen Colbert new show or someone else will pick it up. I’m ready to give both new shows a shot. While I like Craig Ferguson, Letterman is definitely ready to call it a day. Oh and dunno if anyone picked this up. Ferguson has a TARDIS on his desk. James Corden once appeared in a Matt Smith era Dr. Who as a comfortable homely romantic who wanted “takeaway and a bit of tele” on too regular a basis for his more adventurous fiancé. Before TEN got the Letterman Nine had it in a similar time slot. So either 2 things will happen either TEN will keep it or Nine or Foxtel will get it and put it on one of their comedy channels or FOX8. A strange choice as the Late Show is a US flagship late talk show with greater star power than the LLS-it was also strange that Ferguson often aired on 11 well before Letterman on 10-must have been much cheaper for 10 to get the new LLS rights and budgets would be tight for them for a low rating timeslot. So what will Ten replace Letterman with? I suppose they will start the Home Shopping earlier. I’ll have a look at James Corden but Craig Ferguson was so unique it may be hard to warm to the new guy. I thought Channel 10 was looking to lift it’s game. I hope they reconsider and show Colbert. Any chance 10 could show Conan or Kimmel? If it was a decade ago, I might have cared, but everything is on Youtube anyway these days. The network that brings the Bolt Report is not going to show Colbert ? Oh gee, what a surprise, can’t have anyone intelligent around. Colbert doesn’t start on CBS until September anyway so no big deal. I’m already missing his regular show though. What a dumb move by Ten.The Corden hosted show will bomb,whereas people know and like Colbert and would prefer his show.